As with all paint projects, prep work is key. First paint a base coat on the walls; for stripes that's really important because the base coat will be one of the stripes. Use a flat paint that is exactly the same color as the stripe to be painted on. It's also important that the base coat dry for 48 hours before you start to work on the stripes. 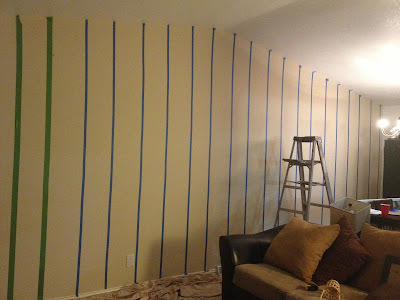 After the base coat is completely dry, begin measuring and marking the walls for the stripes. Measure the wall, starting in the corner that's least seen. Next, divide the wall. Stripes should be between 4" and 12" wide. 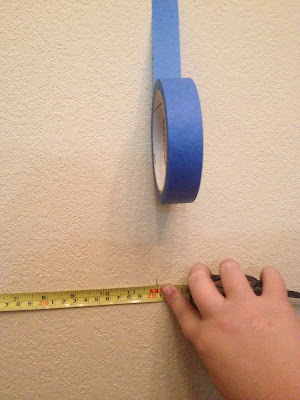 (I did 12" stripes because I have a HUGE wall and anything smaller would be too busy) Place the first strip of tape in that obscure corner where you began measuring. 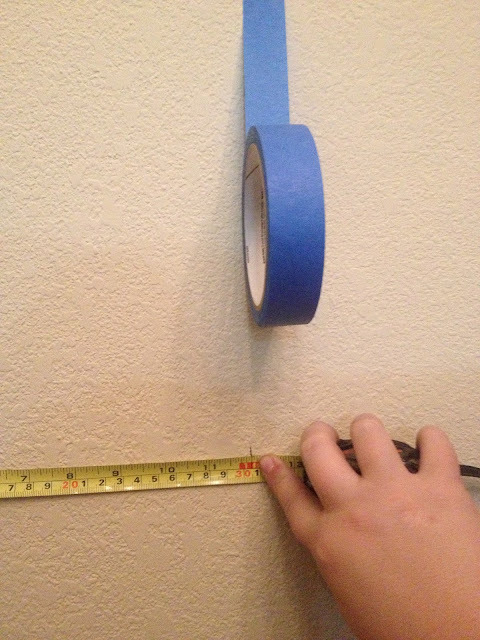 Place the end dot on the tape you've already applied to the wall and press the strip to the wall. Next, if you have one I highly suggest using a laser level to shoot a beam onto the second dot. 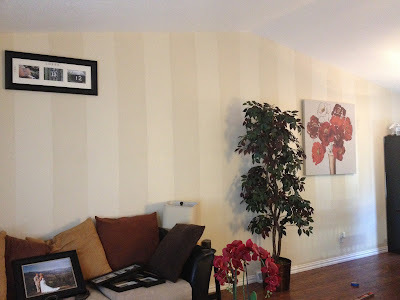 I did not have one so I make several marks on the wall from top to bottom and placed the tape very carefully along each line to create a straight tape line. Tip: Remember that because you will be painting only every other stripe, you'll need to tape out the pattern so that every other stripe is outlined by the tape. 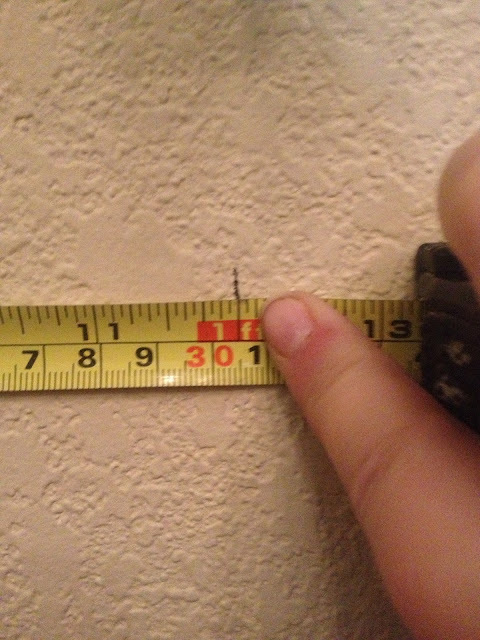 Make sure to tape outside the chalk line; fresh paint will cover up the lines. Tip: You can also make the lines with a chalk line. Use blue chalk because red or yellow is a permanent color. I used both blue painters tape and green frog tape, I ran out of the frog tape very quickly, so I had to make sure to maintain the same measurements using a thinner tape. Basically what I did was split my wall in half. 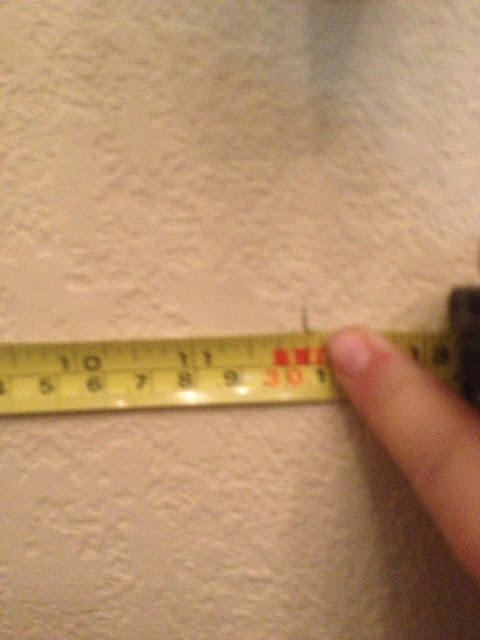 It is 280" and 140" would be dead center. Since I wanted my stripes to be 12" wide I measured 6 inches on either side of center and then created my first stripe. The tape for the glossy stripe (the ones we will be painting over the matte wall) had the tape lines exactly 12" apart, so the other stripe (the matte stripe) would have the tape one both sides inside the 12" perimeter, so that the glossy stripes would all be 12" exactly, and the leftover tape went on the inside of the matte stripes since I was not painting them. Once we remove the tape both stripes will be an even 12 inches. 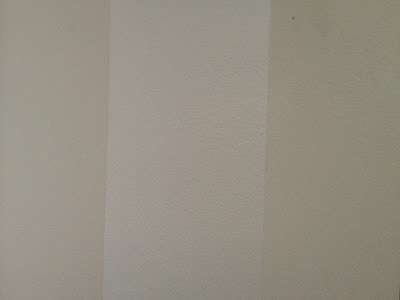 These next two steps are the most important prep work you can do when painting stripes on a wall. 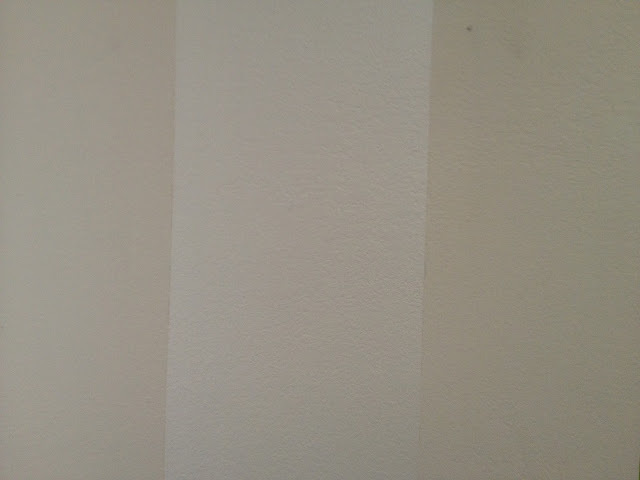 If you do not complete these steps you won't get nice crisp paint lines on your wall. 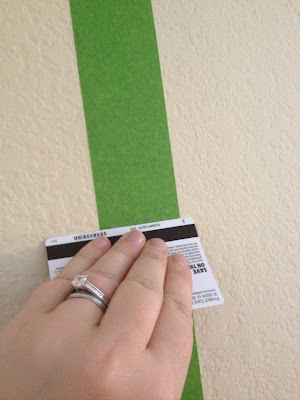 Burnish wall with a credit card to seal the tape edges so no paint seeps underneath the tape. 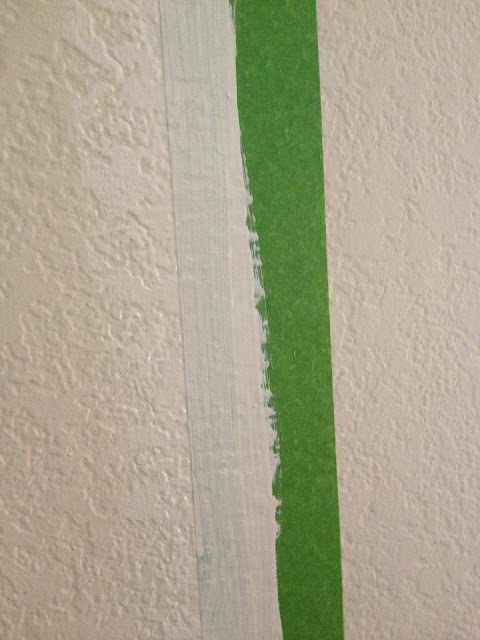 Paint over the tape line with the base paint (the matte paint), making sure to only paint about half the paint line, otherwise when you pull the paint off you will see a distinct line one both sides where the tape was. One coat should be enough. 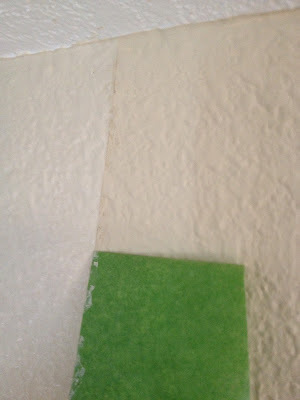 Make sure there are no gaps between the wall and the tape, and if there are burnish the tape again and fill the gap with the base paint to form a seal. Allow the paint to dry for 1 hour. 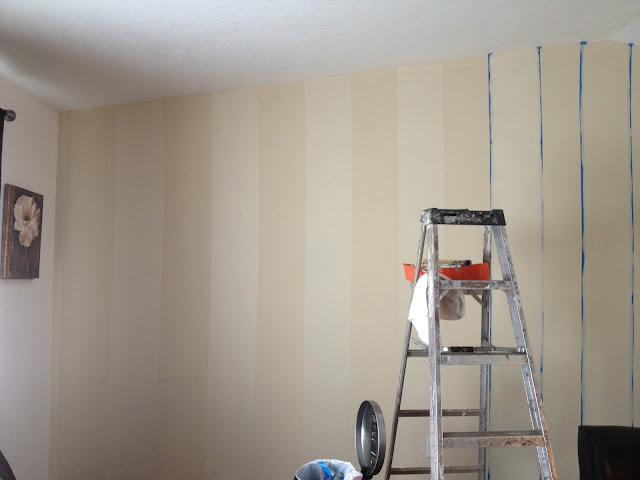 Basically by the time I was done painting all the stripes I could start back on the other side of the wall. 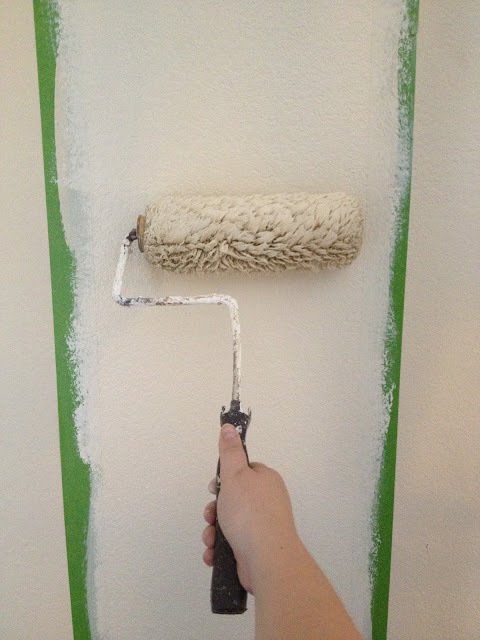 Taking a roller that is smaller then the diameter of your stripes and a small paint brush. Using the paint brush I did the ceiling and above my trim and using the roller I filled in the center. Make sure that you get the gloss color over the paint about halfway, so that the paint lines are very clear when you peel the tape off. 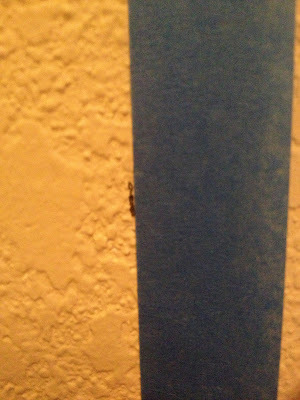 Remove the tape once you've painted the wall, angling away from the freshly painted area as you pull. 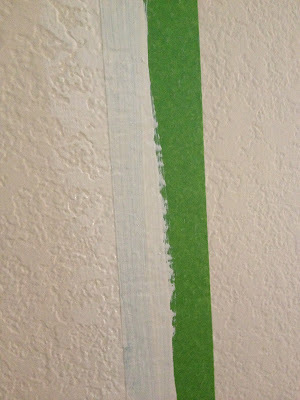 I gave it 15 minutes before I removed the tape, giving me time to paint 1 stripe before removing the tape from the previous stripe. You DO NOT want to leave the tape on too long, I've seen vinyl paint peel after drying and I would hate for it to peel after all this work! 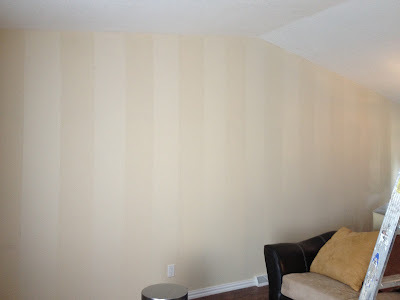 The tape and paint technique worked amazingly, it created crisp and even lines and since the color is the same, one stripe being glossy and the other matte, it created a classy and elegant wall that is subtle and gorgeous!. Progress as I move down the wall! Starting to put my frames back up and my furniture back!